If you do not wish to vote at this time, click here to visit Rogue Vampires stats. 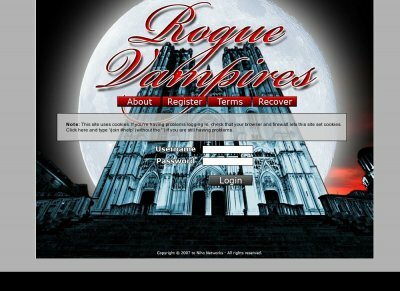 Rogue Vampires is a game where you play a vampire set in a fantasy world. Train your stats, find your weapons and potions, talk to the active community, compete for #1 in the hall of fame in a variety of options, learn the market to earn money. Finally, for the very brave, you can join a player battle ladder for your pride, or start a deadly Vampire Covenant and with your friends try to make your mark in Rogue Vampires.